Donald Healey started building cars upon completion of World War Two. The Westland and Elliott were the first two cars from the company and they went on sale in 1946. 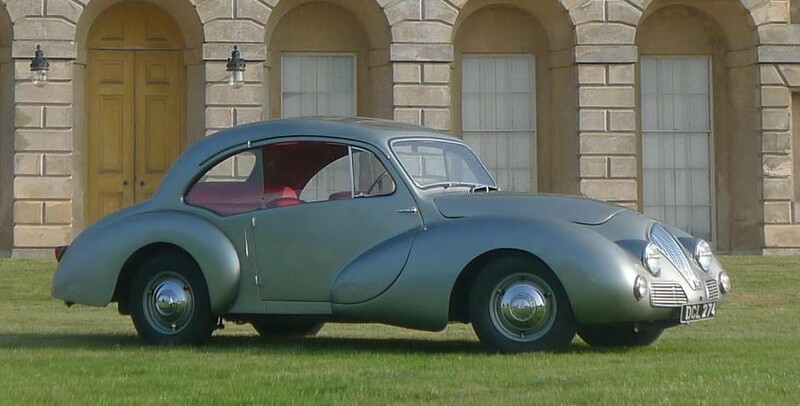 All Healey-branded cars used a 2.4-liter straight-four engine from Riley making 104 horsepower. He built his own chassis. The Donald Healey Motor Company sent 39 of its chassis (with Riley engines attached) to Duncan Industries Ltd. They bodied 15 of the cars as “Drones” with fairly unattractive and simple bodywork. They then built 23 of these Saloon models with pillarless doors and swoopy lines. They also bodied some Alvis cars with coachwork very similar to this. Only eight Duncan-bodied Healeys are thought to still exist – six of which are the Saloon model like the one above. Ownership history of this car is known from the 1960s and the it was restored professionally in 1996. It has been used here and there and is in generally great and usable condition. It is estimated to sell for between $28,000-$37,000. You can read more here and check out the rest of this sale’s lineup here. This entry was posted in Uncategorized and tagged 1948, auctions, Bonhams, cars, classic cars, duncan, healey, saloon by classiccarweekly. Bookmark the permalink.